Chocolate ,chocolate, chocolate!Its chocolaty atmosphere at my place.My daughter and myself can live just on chocolates.I just love eggless chocolate bakes.I baked this brownie yesterday on Sanjus demand.I had prepared one more version from one blog,but this came out better than that.My baker buddy Lakshmi says Brownies are cut into squares,but I didn’t find have a square tin, of course I could have cut it into squares,next time will do better. 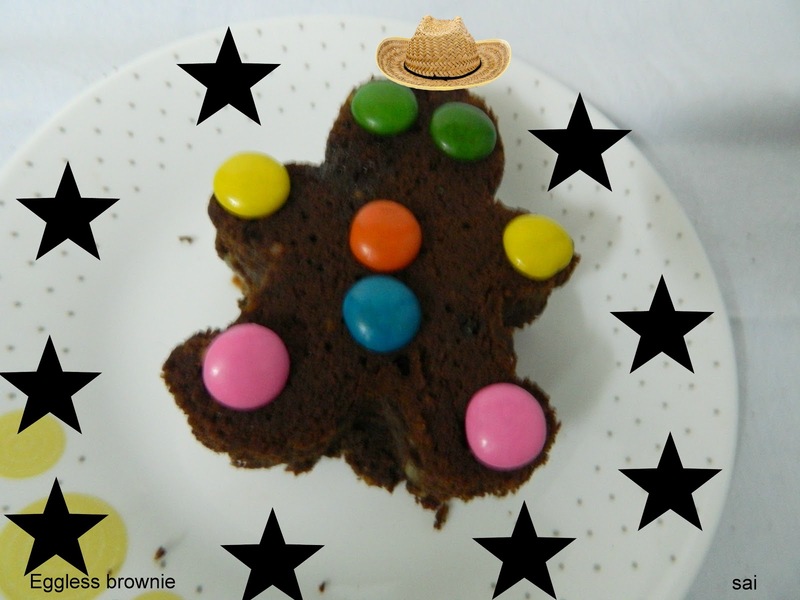 Theres always a next time.And I do follow all the small tips given by her.This brownie can be had as a sizzling brownie with vanilla ice cream in a sizzler plate.This is my second sizzler plate which I had mentioned in my Babycorn schezwan sizzler Italiano post.My son wanted to cut the brownie into gingerbread man shape so did one for him since he is very fascinated with that shape. Mix together curd and sugar until sugar dissolves. Add baking powder and baking soda and keep aside for few minutes and the bubbles appear. Sift together maida and cocoa powder and add choco chips and chopped walnuts and keep it aside. Add oil and essence to the curd mixture and whisk well. Add the flour mixture ,1 tsp a t time to the curd mixture little by little and mix it scraping the sides in between untill smooth. Meanwhile preheat the oven to ,200 deg C for 10 minutes and grease a pan. Add the cake batter and bake for 10 minutes at 200 deg C and then lower the temperature to 150 deg C and bake for 20 -25 minutes. Once done check the cake by inserting a toothpick in the center if it comes out clean that means it is done. 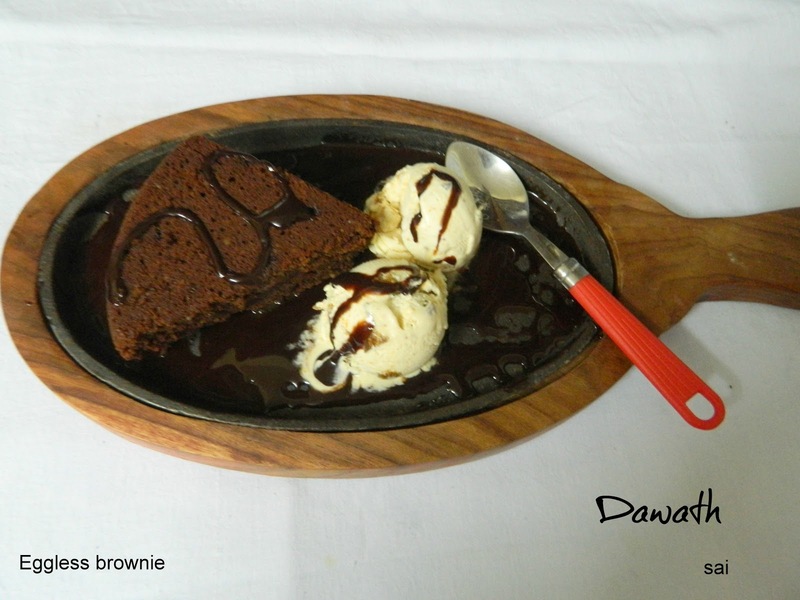 Let the brownie cool completely before you slice attack it and relish it with vanilla ice cream and chocolate sauce. You may cool it in the tray for 5 minutes and then cool in a wire rack for about 30 minutes. Use fresh buttermilk or curds,mine was little sour, so I could make out mild sourness in the cake. The recipe calls for 3/4 cup sugar but I would go for 1 cup. Brownies are mostly cut into squares. 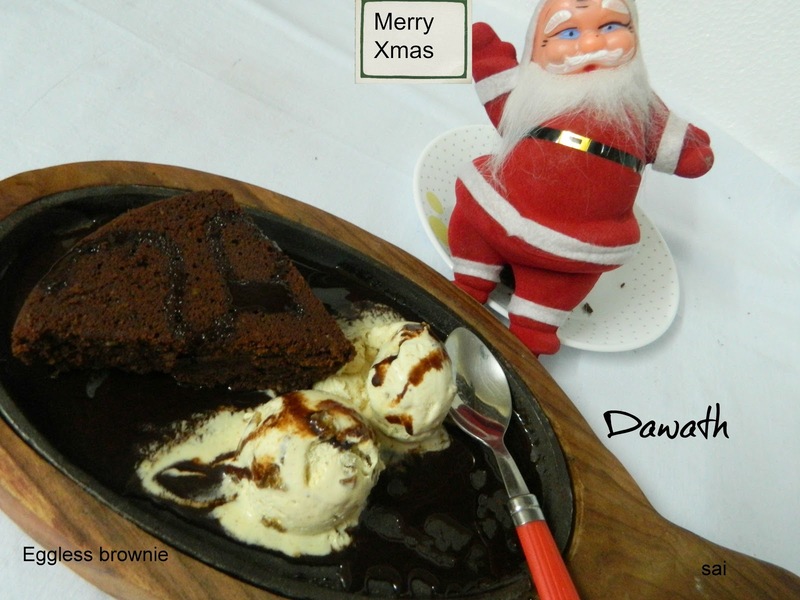 My brownie is little over baked ,it is better to keep it little goey. Some brownie recipe calls for icing sugar substitute to granulated sugar. 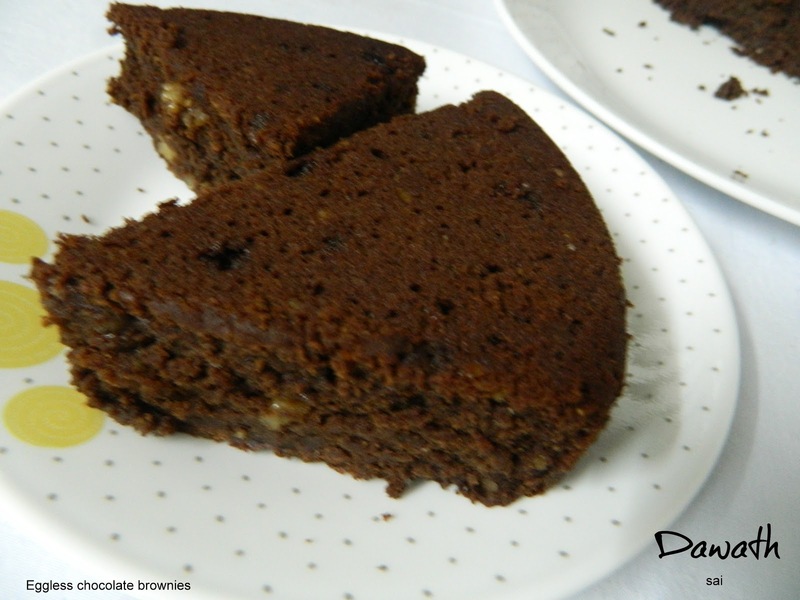 I am a vegetarian, Therefore, I liked eggless chocolate brownies. Thanks for wonderful post.